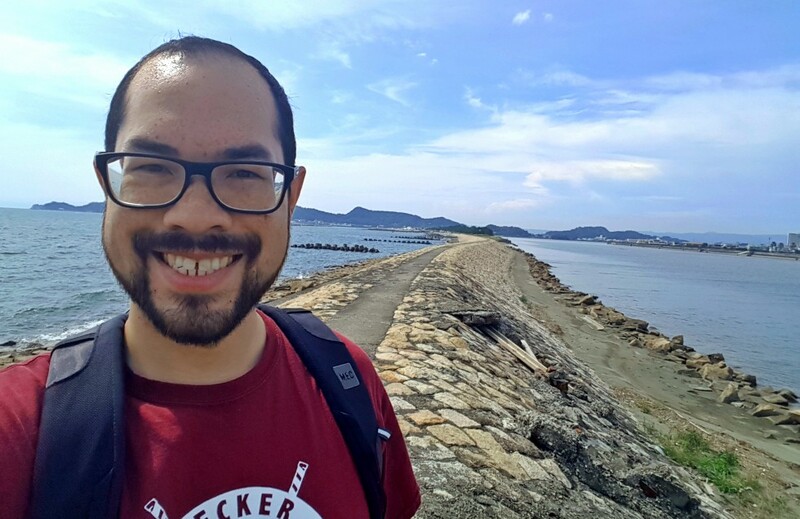 McMaster PhD student Jason Au explores the coastline of Wakayama, Japan, on his day off. Au is in Japan taking part in a unique fellowship that allows him to work on a project with Japanese researchers, while providing him with opportunities to explore and experience Japanese culture. As a PhD student in McMaster’s Department of Kinesiology, Jason Au is used to spending his summers in the lab but this year, he’s receiving a very different kind of education. Au is currently in Japan, taking part in the Japan Society for the Promotion of Science (JSPS) Summer Program*, a unique ten-week graduate student fellowship that allows him to work on a collaborative project with a research team at a Japanese University, while providing him with opportunities to explore and experience Japanese culture. Since arriving in Japan nearly a month ago, Au has participated in Japanese language and culture classes, and is now working on a joint project with Japanese researchers in the Department of Rehabilitation Medicine at the Wakayama Medical University, located in the Kansai region of Japan. He is studying body temperature regulation in those with spinal cord injuries during exercise. We had been talking to a group in Japan about doing a collaboration along with another group in the UK. This grant, which is for Canadian Master’s and PhD students, happened to come along and it lined up perfectly with what we already wanted to do. There’s only so much you can do within two months – so we’re just trying to collect as much data as we can and then bring it back to Canada and see what we have from there. Tell me about some of your experiences learning Japanese culture. 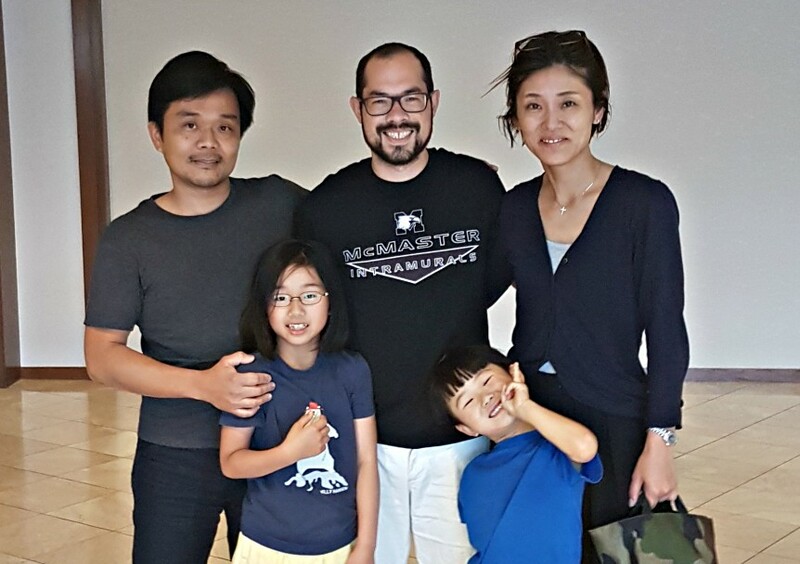 Au and the local family he stayed with during his “Home Stay” experience. The first week was pretty structured, they had our whole schedule planned. We had a lot of language courses. Then, there was a program where we stay with a Japanese family – it’s called a Home Stay program – that matches foreign students with a local Japanese family. It was super-interesting to live with a family from the area for a couple of days – we did a whole bunch of touring and activities; we did a road trip to Mount Fuji, and stayed with some of their friends in the area. What has is it been like to learn Japanese? It’s very difficult! The first week they introduced us to basic sentence structure and also introduced us to the very typical words you would need to know, like what to order at a restaurant, how to ask for directions, or how to travel on the train or the bus so we could get to our host institution. It was a bit overwhelming for the first two weeks – part of that was the language barrier, because you can’t ask things that you want to ask very easily and even though the Japanese people know how to speak phrases of English, it’s difficult to carry on a complete conversation. But everybody is so friendly that it makes it very easy to live here, it’s just difficult to communicate at first. Tell me about the research project you’re doing while you’re in Japan. The trial that we have here is a combination of the work we’ve done at McMaster on autonomic health, so the nervous system, in spinal cord injury and the thermoregulation, or body temperature, work that they’re doing here in Waykayama. It’s an autonomic, or nervous system response, that causes us to sweat during exercise but some individuals with severe spinal cord injuries have nervous system damage and aren’t able to sweat. What we’re trying to figure out here is if we can use very specific tests of nervous system health to predict what kind of temperature responses individuals will have in response to exercise. Being able to classify individuals and having that information right off the bat might help professional teams to know what they’re working with when they’re setting up exercise routines or looking at safety during exercise in hot temperatures (like we are experiencing right now in Japan). Au with the research team in the Department of Rehabilitation Medicine at Wakayama Medical University. 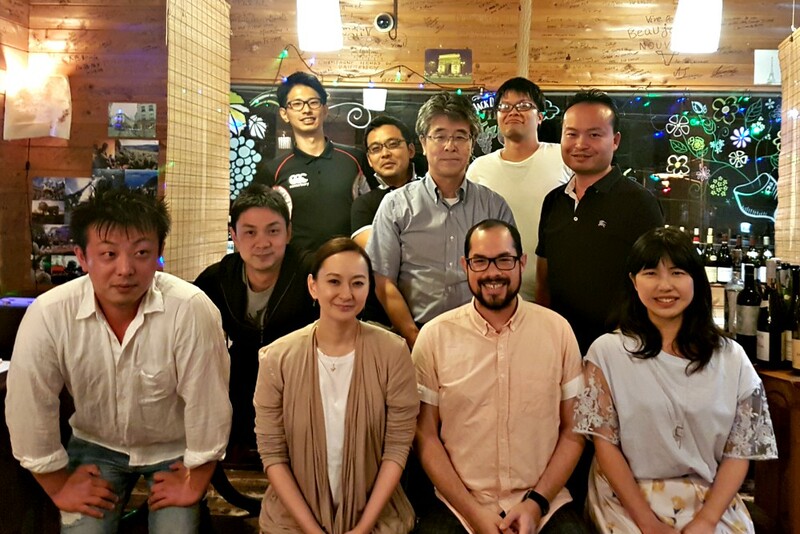 What has it been like to work with the Japanese researchers? It’s been really great. For me, being at the end stage of my PhD, right now it’s about technique development and trying to learn what they’re doing here and what types of equipment their using to maybe bring back to Canada at some point. It’s interesting because the team I’m working with is almost all physiotherapists who are in various stages of their careers and are all interested in science research, whereas back home, I’m used to more of an academic environment and we don’t have so much exposure to that kind of applied health care. It’s been really interesting discussing their work from more of a day-to-day physiotherapy, occupational therapy level. What’s the highlight of your trip so far? Doing the typical Japanese activities that everybody loves to do here like going to eat sushi, going to eat ramen, going to an onsen (a hot spring) to relax for an hour or two. Wakayama is in the country, so it’s a little different lifestyle than living in the big city. It’s a lot quieter here, there’s a lot more greenery and the downtown is less busy. So, I’ve done a lot of biking to explore the mountains and beeches. It’s also the terrifying moments of going out to eat, not knowing at all what you’re ordering and not having a single picture on the menu to help. The last time I went out for dinner, I just picked the most reasonably priced thing that looked like a meal and just hoped that it was something edible – that part has been both interesting and terrifying on a daily basis! You’ve been in Japan for about a month, how have you found the experience? For me, personally, it’s been very eye-opening because I’ve done my entire postsecondary career at McMaster – undergrad, Master’s, PhD – so not even leaving Hamilton for the most part over my research. You get so set in your ways in your own lab, you need to go to another lab and see how it works. One of the small things in the lab here is that no one wears shoes, which is very, very different from a research lab in Canada. We all have to wear slippers when we come in to the lab. I think it’s a cleanliness thing, it’s part of the culture in Japan. It’s small things like that that make you realize, it’s not a universal constant for science and there are small changes that, good or bad, make research different in different parts of the world. Would you recommend an international experience to other students? Oh, definitely. I think the main value is broadening your research views, extending that collaboration which I’ve been told is important down the line if you want to continue in academia. Having those international collaborations especially with arms-length disciplines, is important for you to bringing those ideas back and create something new. On a personal level, I think it’s just a really great way to get to a new city – it’s breaking up the grind of the PhD and adding something new. You don’t feel like you have to work 24/7 when you’re in a new city. It’s expected that you go and live a life that’s outside the lab. So, it’s been really refreshing. *The Japan Society for the Promotion of Science (JSPS) Summer Program, invites graduate students the United States, Canada, Sweden, France, and the United Kingdom to collaborate on a project with researchers at a host institution in Japan, while having an opportunity to be immersed in Japanese culture. Au is one of 11 Canadian fellows taking part in the program this summer. The Canadian fellows were sponsored by Mitacs and the Canadian Embassy in Japan.